I’ve had an itch for quite a while. An itch to run. Folk that know me will know I’m not built for running. Always been big and not got a great engine so running is a bit of a challenge. After the hill walks my legs take days to recover and going back to school days, sprints were fine but cross country was awful. Despite all that, I still wanted to give it ago. I kept putting it off. I was scared…of failure, of running in public. Daft but when you’ve got something like that in your head it can be hard to shake. However, if I want to run a 10k at some point I have to start somewhere so today was the day. Looking at Google maps I planned a straightforward door to door run which would take over 3km. 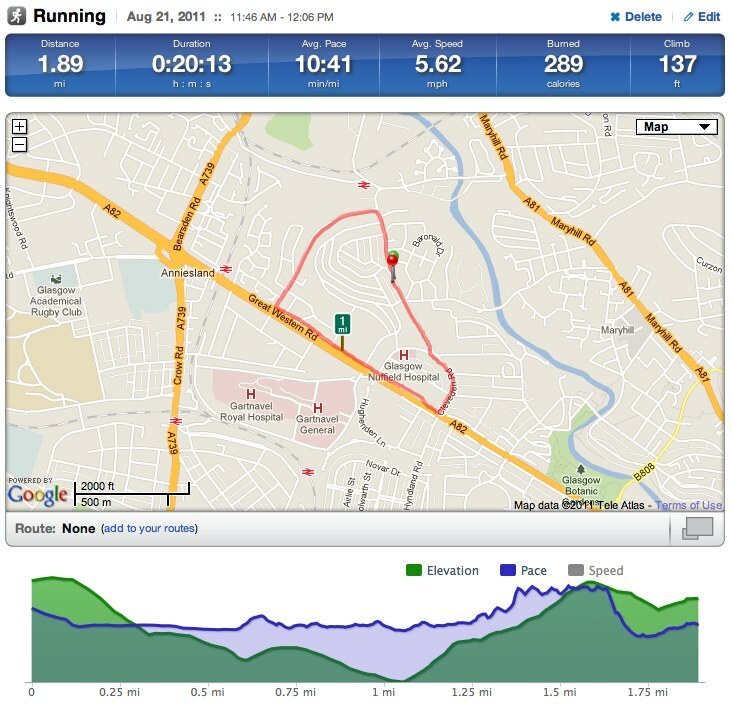 The results are below and in more detail at RunKeeper. Main snag is that I live on the top of a small hill so whatever I do it will involve a hill of sorts. Kept the pace slow and it was going ok until the incline up Gt Western Road and the climb up Cleveden. I could feel a bit of stich coming on so had to stop. I walked up the hill and ran the last 200 metres. So overall not too bad. However my legs did feel pretty sore afterwards despite the hill walking, cycling and badminton I do. The impact from running on the road is not to be ignored. The good news though is that I enjoyed the run so the current plan is to do the same route midweek and if that goes well (and assuming my legs feel good tomorrow) then I’ll pay a visit to Achilles Heel and sort out a more appropriate pair of running shoes that will help with the impact on the roads. I may also look into running offroad to help with the impact but baby steps for the moment. Reason for doing this is twofold. I want to build up a bit more stamina and endurance and also help with the recovery after the hill walks. Secondly, it’s something different and it gets me outside and off the bike (which will still continue). Third (I did say two but who’s counting) is the inkling to run a 10k, maybe before the end of the year. Depends on lot’s of things but it’s good to have a goal when starting these things. So more posts hopefully soon, even if it is to say my legs are buggered and I can’t go on! 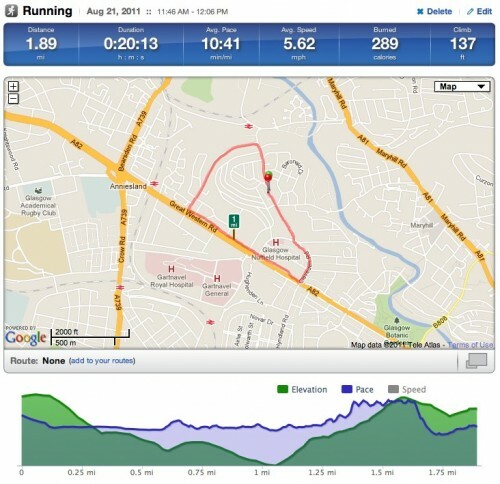 One final thing – it’s nice to be using RunKeeper for, you know, running! I did 10k using JogScotland programme. Like you, on larger side and previous attempts at running had me overdoing it. Good luck! If I see you I’ll cheer you on! The stretching is something I need to do more of – couldn’t believe how tight my calves were today. Cheers for the JogScotland tip – I’ll look into it as it maybe me and a couple of others starting off on this. I remember you blogging about the running but couldn’t remember who you ran with – was just looking through your old posts. Love that ‘god of the morning’ post. It’s running in winter I really want to do – summer not so much. I was feeling kind of knackered when I emailed you earlier today and I’m struggling to see when I can fit the runs in, but I’ll see how I get on. Only ever run in the evenings before but as working until 10pm I will have to try the mornings. I’ll keep you posted. Are you still set on 10k rather than 5k? 10k. Maybe. Probably. 2nd run tomorrow so time will tell. I recommend the use of a heart rate monitor for when you are running, particularly in the early stages when you are still conditioning your body to a different type of exercise. It is easy to overdo it trying to maintain a steady pace when gradient/headwind are pushing your heart rate too high, that leaves you exhausted and very sore. Plus it is another gadget to play with that outputs statistics and has online software to “investigate”, I am amazed you haven’t bought one already to be honest! iPhone was an ok substitute. Listened to some tunes and also the software gave me some pace updates via voice. However…there’s always an however…I’ve been looking at some gadget options so there may be a purchase in the future if I get a bit more hooked. Thanks for the advice though – much appreciated.